Add garlic, ginger, onion, coriander, cumin, turmeric, chilli flakes and 80 g or 2.8 oz water to mixer bowl. Cook 2 min/100°C or 212°F/speed 2/MC on. Add stock, water and tomato paste. Cook 7 min/100°C or 212°F/speed 2/MC on or until boiling. Cook 30 min/100°C or 212°F/speed spoon/reverse/MC on. After the above cooking period, cook for a further20 min/steaming temperature/speed spoon/reverse/MC off. Step 7 is to reduce the sauce so that it becomes nice and thick! Watch it closely, at 20 min check to see if the meat is tender and there is still a small amount of gravy left. At step 6 use speed 1. At step 7 use speed 1 and ST temp if using an Intelli and 120°C or 250°F if using a Supercook. Made tonight and all 3 kids loved it and hubby aswell which was a bonus.. Definitely making this again.. Thanks for another awesome recipe. This was really easy to make and was full of flavour. I added a tablespoon of cornstarch to thicken up the gravy a little bit and steamed potatoes for the last 20 minutes and added them to the curry at the end. This was definitely an easy curry to make, I used cheap cuts of beef and oh my goodness they fell apart it was so tender. I did find it to be a bit bland though. Next time I think I would add more tomato paste and beef stock powder. It needs some other spice too, I just can’t put my finger on it. I would say that the blandness of this lends itself to being more of a stew than a curry. This recipe was very simple and easy to make. I used a chuck steak and popped in the slow cooker. The meat turned out lovely and soft but I felt it was a bit bland in flavour for my palate. The green capsicum suggestion sounds great and I may try again using fresh ingredients instead of the powder forms (and just whizz them in to a paste). Made this tonight from the Taste of India cookbook. So nice and so easy. I was only feeding hubby and myself so I halved the recipe and the meat was so tender. Needed a bit more liquid so I added coconut cream at the end. Perfect. Thank you so much for these lovely recipes. Just bought diced beef from the butcher so it was even easier! I followed recipe exactly but found it really bland sorry! I’ll try and pack some oomph into the leftovers for tomorrow, eg a bit of salt, extra tomato paste and maybe a spoon of sweetener to balance the tomato. Very easy to make with perfect results in my bellini. Full of flavour. This is another delish dish! Pity i had tough beef,needed to cook longer really but didn’t have the time. Amazing gravy. Would be a great pie filling . Amazing! Gravy was runny so I took out the meat and cooked for an extra 10mins. 4 clean plates! A very enjoyable dish. Took me back to a popular restaurant here in Perth (the chef cooked for the Aussie Cricket team – in India!). The second time around, I redced the cumin a little as it was a little strong for a dinner guest I had over. Other than that – perfect! Another never fail Indian Curry from Nik! 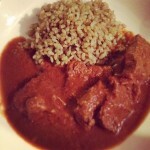 The Beef Madras is such a great and easy recipe. The meat is so tender, and the gravy has a great depth of flavour! Just amazing! I made this a few days ago in my brand new Bellini. It was so simple to make, yet such a delicious meal. Tender beef with a rich, yet fresh tasting gravy. I can’t tell you how disappointed I was to find my hubby had gobbled up the leftovers! I can’t wait to make it again. Seriously, I’ve even dreamed about it!! Tastes great and not hard to make. We have this every week or two. Made this with chuck steak and it tastes like it’s been slow cooking for hours. Tender meat and beautiful flavours. Will definitely make it again. Thanks Nik. such an easy curry to make – if im feeling lazy this is my go to meal! its quicker to make this than go out and get take away. This was delicious – I am going to try it with 1kg of beef next time as we are a family of five big eaters (3 sons!). We had enough for dinner for us all, but I like to have some leftovers. Thank you! Thanks for your curry recipes. This one is saving my health eating plan when I am to tired to cook something health after a long day at work. YUM!!! Very tasty curry and super easy to make. It is great that it uses ingredients mostly from the pantry so you can make it easily when you don’t have a lot of fresh herbs. This saved me during P2 and continues to be a regular feature (read weekly!) in our house. It’s divine and the flavours are amazingly wonderful for something so simple to make. Seriously cannot rave about this enough!!! My current favourite ! And so easy. I’m just whipping up another batch before I head off to work. Dinner sorted !! Super easy and very tasty . I’ll add more chilli next time as I like a bit more heat . Served with steamed beans and small amount of rice . I got 5 serves out of this recipe . This curry surpassed my expectations, so rich and flavoursome. Delicious! Nik, Absolutely beautiful! Thanks for a lovely recipe! Another great recipe. At step 7 i added cauliflower, red capsicum and carrot and i found the sauce didnt thicken that much but with the veggies added that might be why. Wanting to cook this but I don’t have all those dried herbs in the cupboard as I prefer to use fresh. My Question is are the quantities still the same or should I halve them? I had a tougher cut of meat so cooked until the step of adding the meat and put it all in a slow cooker. Halved the water for the stock and had no ginger so left it out. Was absolutely delicious! Thank you Nikalene! This is a regular in our house and loved by all. Such a great meal to make when fridge is pretty empty and you need something easy but tasty. Freaking AMAZING that is all. I havent got any of the beef stock can i just use the normal tmx veg stock? That’s what i did – delish! I’ve just made this for the second time this week but tonight I topped it with mashed sweet potato and baked it in the oven and served with steamed broccoli, beans and Brussel sprouts. So good. Amazing!! Full of flavour . Will definately be a favourite on the menu from now on – so easy. simply the best curry I have ever made in my TM! 2nd time around got the liquid meat ratio right after not having enough beef last time. Subbed the onion, ginger and garlic powders with the real thing and cooked with olive oil 2mins rather than water. Very yummy thanks for recipe. Awesome taste however didn’t make enough for the whole family!!! We all had small serves!!! This is such a quick, easy, tasty, low calorie meal. It should be on everyone’s menu plan. I actually use diced and trimmed ‘bone-in blade steak’ as we really like this cut – it also happens to be one the cheapest beef cuts (apart from mince) you can buy at WWs. I stock up when it’s $5.99 – $7.99 and it’s so good just as steak and excellent for curries and casseroles etc as well. Just about to make this again today to take to my sister’s tonight for a shared dinner. Thinking I’ll do a double batch (one in each tmx) and use just ‘powders’ in one (take husband’s serve from it) and in the second batch use fresh garlic and ginger and butter and then mix the batches afterwards. oh my goodness so tasty & the meat was very tender. Can’t wait to make it again. Lovely flavour, tender beef, beautiful smell. Really yummy dish! A great meal the whole family enjoyed. Thank you! Yum! Made this last night for my best friend who was babysitting for us and it took all my will power to not keep picking at it!! I used beef stir fry strips as that’s all I had, so reduced cooking time and checked regularly so I didn’t over cook the beef. It was perfect! Tender beef and tasty sauce! I also used 1/2 onion and 2 cloves of garlic instead of powder. I had all the ingredients in the cupboard so it’s easy and quick to make on a whim! So easy to prepare, its a favourite in this household. Smells amazing whilst cooking and tastes even better! I love, love, love this recipe!! I’m making it again tonight. Thanks for sharing all your recipes with us they are amazing!!! Best curry in the thermi – cant wait to try butter chicken! This is only the second curry I have made in the thermomix and it has inspired me to make more. I left out the chilli so my young children could enjoy it and even my fussy husband loved it. Better yet I had everything I needed to make it in the cupboard. Such a great ‘go to dish’ for mid week – simple and basic ingredients but delicious. This is another go to recipe – I serve it so many way – with rice, cauli rice, mash and steam vegetables 🙂 My kid love it. New to Thermomix, new to Skinnymixers, fellow Adelaidean….. holy cow, this recipe is TOPS! This recipe is delicious and deceptively easy. I also think it is an excellent option for a newish thermomix owner/user. This recipe is a hit with my bunch of fusspots. This is the second time I am making it. I like the fact I know what is going into the recipe and the house always smells divine whilst its cooking. Thank you Nikalene for putting so much effort into producing these fantastic recipes we can all enjoy. YUM !! The steak was so tender, the sauce was nice and thick. I made it to the recipe with no changes and there were no leftovers. Definitely added to our weekly meal list. Huge hit with Mr 2.5yo and I tonight. I’m solo parenting this week. But I was still able to whip this up after work and on the table within 30 minutes! I measured out all the spices into a jar last night and diced steak, so just threw it all in. Few changes: I added pumpkin and carrot with the steak, which reduced down into the sauce making it lovely and sweet. I serves with rice – I cooked this in the basket while the steak was cooking. This gave it a lovely flavour and meant that the sauce thickened nicely without having to cook for a further 20mins without MC. Win win! Thank for the recipe. It’ll be a regular here. I whipped this up in no time tonight instead of getting take-away. I made it with lamb. It was so easy to make and was very tasty and rich. Thanks for the recipe! This is the best curry ever, we practically live off this!! This is one of my favourite recipes! So-much-flavour!!! This is on my weekly meal plan more than once. As is the chicken variation. Simple, easy to make a real top quality recipe, made with love. Thanks! Can’t wait to cook this. It’s going to be my go-to dish when I don’t think I have anything in the house to cook!